Closing leads takes blood, sweat and lots of effort. You need to be prepared to act on certain principles so that your sales process goes smoothly. If not, be sure that it can take seconds for a situation to get tricky, especially when communicating through email. Cold outreach through email is widely used and is considered a great means of customer acquisition. You can get a lot of interested people in your service but you should be prepared for what comes next. 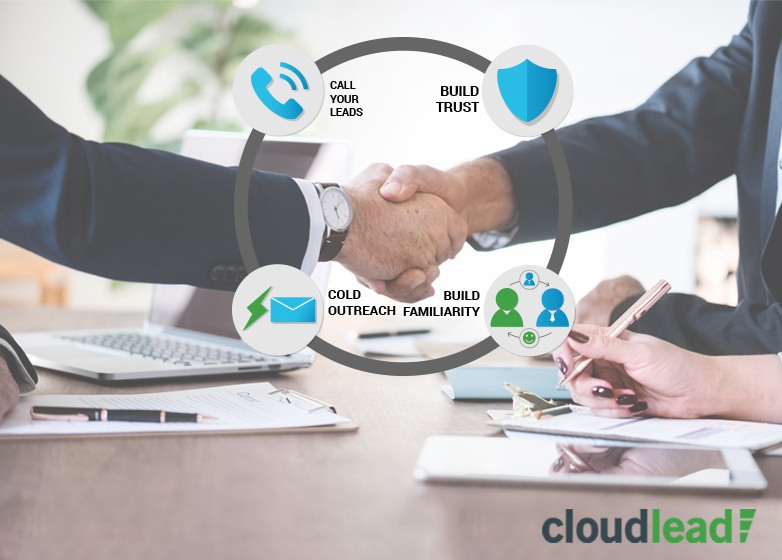 At Cloudlead, we want all our clients and everyone, to maximize their ROI on B2B data. It may be true that data quality will affect your prospect to lead ratio from your cold email campaigns, but its equally important to focus on what’s next. That is, closing leads. Congratulations on getting your prospects to convert to leads. However, as mentioned before it can get tricky when dealing with leads on email. Always be aware of the fact that a lot of misconception can take place when communicating in text form because you need to “sound” personal and human. Unfortunately, the hard work doesn’t just end there. The second step you need to start on is work on getting your lead to talk to you on call. Most of us would agree that when we speak, both parties have the power to express their opinion. This is why it is highly recommended to get your client to have either an e-meeting or Skype/ phone call. Always make sure that your initial cold email includes a prominent enough CTA that compels your prospect to talk to you. Why not try to incorporate a meeting scheduling software such as Calendly, which is synced to your calendar? This way your chances of getting a meeting rescheduled goes down. Plus you wouldn’t need to send multiple emails to your prospect which is another problem off your chest. The takeaway from this point is simple. Trust your voice. Especially when you have a warm lead who wants to know more. Closing leads is always easier when you make it comfortable for your potential clients. We all know the power of trust. It can make or break a deal in seconds. So what makes your prospect think positively about you? And how will it contribute to your effort of closing leads? The answer is your marketing efforts. The trust gap in sales is often facilitated by how and what you market. You may be thinking where this factor plays a role in the customer acquisition process? You are right to think so. Your email signature should include any awards, mentions on publications, events your attending and popular and relevant blogs to showcase your existence in a positive way. There is no need to overcrowd your email with loads of content, the point is to get your product and its benefits across so that it can add to your authenticity. First off, remember that outbound leads mostly require more effort in the ‘trust’ section. If you already have a blog, website and social media existence (which you most certainly should! ), then it already acts as a passive platform for potential customers to become familiar with your company. Therefore, having a strong existence and showcasing it will definitely make it easier for you to close leads and secure the deal. However, don’t take these inbound marketing methods for granted, especially if prospects have been connected to you through outbound means such as cold emails. Your inbound marketing modes act as an additional piece of communication for future clients, but it is your responsibility to ‘follow up’ and keep them updated on content and services that are relevant to their key interests. Keeping a pool of prospective customers engaged like this develops a sense of reliability and trust. In turn, this could help establish a long-term relationship and increase sales. Stick to this slogan: ‘Pursue your customer without pestering persistence.’ It’s important to strike a balance so that the potential customer doesn’t get annoyed. But you must make sure that you stay ‘reliably connected’ to prospects during the pre-sales process. Once you’ve gained trust, there will automatically be a rise in customers and sales…and that just might be a start to your success in B2B lead generation. Reply as soon as possible. This point may be overused, but it is severely underutilized. When you spent a lot of effort personalizing your email to gain your prospects interest why waste that effort by replying late. Replying late can cause a lot of leads to exit your sales funnel and hence, they never qualify. It’s always a smart move to reply to your potential customer immediately. If not within a blink of the eye, then at least within a span of 15 minutes. Don’t make them wait too long because everyone has their own schedule and work to get done with. So if your prospect has signed up for a free trial, follow up with them. Also, don’t forget to PERSONALIZE your response. This makes the customer feel important and helps break the ice. You’re responding through email. Make sure you reach out to them by including their first name – also make sure the email is smart, concise and to the point. This includes a proposal to connect through a calendar invite. Mention to them that you will wait for their response. This makes the customer feel more in control and valued. If you don’t hear from them, don’t hesitate to get in touch through another mode of communication, such as a phone call. Don’t take this title literally. It’s okay to explain your services, but don’t oversell it to the point of annoyance. Focus on the customer and do not ramble on about yourself. At this point, the customer is a priority and the services should be directly linked to their wants and demands. Unfortunately, many companies make the mistake of advertising their services and prior achievements within one email. This can put off the customer and make them feel like you’re pushing your products services on them. This, in turn makes them feel pressured. Avoid this mistake and make sure any communication is based around WHAT THEY WANT. If you follow up with what the prospect wants and deliver it, then the account might turn into a regular client. This entire post is about basic techniques to close leads from cold emails. Once you gain the attention of a prospect, make sure that you follow up regularly. Last but not least, focus on the prospect because this will help you turn a customer (gained through cold email) into a regular client. Closing leads is always easier if you can integrate these factors into your lead generation process. If you are looking for stellar quality B2B data that can improve your outbound process significantly, then contact us with your data request here.